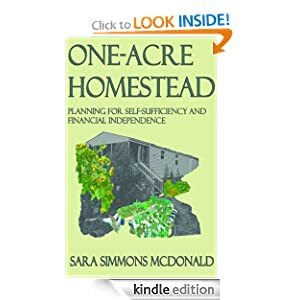 I very much enjoyed reading this book and I believe it is a book that will be most helpful for people who would consider themselves to be newbies to homesteading and/or permaculture. I personally am new to permaculture. I’m no expert on homesteading but I have been homesteading since 2008, slowly adding new skills to my repertoire (having young children keeps me in the slow lane). McDonald gives some thought-provoking advice throughout. I’ve read through the book (except for the “Our Journey” section) twice. I’ve given the book a 4-star rating on Amazon; I try to reserve the 5-star ratings for books that absolutely “rock my world.” There are a few things about the book that make it a 4-star book as opposed to a 5-star book. First, the “Our Journey” section was a bit long and I wondered when we would get to the meat of the book. Second, she did speculate a lot about what she would do in the coming year. It is good that she shared her plans but, for the readers, we cannot know how those plans actually turned out when put into practice. However, she does blog about her homestead at http://wildhomestead.org. She is not an expert homesteader (whatever THAT means) and that is fine; she does not claim to be. This is her story about her experiences and plans for the future. The last thing is that she is homesteading in Louisiana so some of her crops might not work for those in other climates. Overall, though, I do recommend it if you have a ½ to 1 acre to work with and want a permaculture design. It is worth the $2.99 price tag. Focus your first years on growing easy-but-useful foods such as lettuce and other leafy greens. But, of course, you should only plant foods that you will eat. “Greens and herbs are among the easiest things to grow.” The great thing about leafy greens is that you get to consume most of the plant (unlike other plants such as tomatoes, squash, etc.). Additionally, when you sow the leafy green seeds “thickly”, when you thin out the growing plants you can eat the ones that you thin. “My recommendation for you the first two years is to practice good recordkeeping. Keeping good records in the early years will facilitate your planning for the later years. You will be much better prepared to avoid the same mistakes or to give up because you feel like you aren’t making any progress.” Ah, this has been one of the hardest things for me to keep up with until this year. Of all the systems that I designed, it turns out that what works best for me is a one-subject spiral-bound notebook in which I write the date and what I did in the garden that day and if we got rain. I keep it on my counter so that I update it daily. Here is a short video of my notebook. She stresses the importance of finding fruit plants that are suited well to your climate. They will be more productive with less work on your part than trying to grow something that is not well-suited to your climate. For such a small space, it is best to skip large livestock. Chickens for eggs will work but she feels that it will be a stretch to try to properly pasture on this small space meat chickens or goats. She also recommends against growing grains and dried beans for self-sufficiency; rather she shows how growing other starches such as potatoes and sweet potatoes will give you more calories in less space that is required for grains and beans. In all of these pieces of advice, she goes on to explain her reasoning. And she has lots more advice in growing food but also in other topics of homesteading, self-sufficiency and home economics. As I do with any advice offered by another, I keep what resonates with me and toss the rest. In fact, she specifically offers to the readers to do just that: keep the advice that is relevant to you and skip the rest. If I could give a 4 ½ star rating, I would. I am not disappointed that I took the time to read this book. Actually, I’ve already read it twice and I will be sure to refer to it again and again. If you have read it, I’d love to hear what you think of it; or if you have read a similarly themed book that you have enjoyed, please share. Leave a comment below; don’t forget to subscribe via email, WordPress reader, YouTube or Twitter. Thanks!